I've ordered 2 items from these folks and, so far, the customer service has been outstanding! Pretty speedy shipping too. I'll definitely be ordering from them again! Although the item I purchased was garbage, the staff at westernemporium was outstanding. Pleased with the ability to locate hard-to-find styles. Site is easy to manipulate. My exchanged vests arrived today and they fit just perfect, it's exactly what I expected in style and fit. I can't thank customer service enough for all their help and wanted to commend them on their excellent customer service, they have made shopping online with historical emporium an absolute pleasure and I would not hesitate in using their services again. I ordered a man's shirt for my husband and it's so beautifull, the colors and fabric are great. The only thing about the shirt is that it has a white collar which was not apparent in the picture, we were a little surprised. I also ordered a lace parassole, it was an impulse buy and I don't regret it, like everything else I ordered I was thrilled with it. I had to send back one of the two skirts for another size and it didn't take long befor a new arrived at the door. The fabrics, cuts and quality are great, I was really happy. This clothing is extremely well made. It is NOT costume junk. That makes me a little uneasy as well as pleased. The detail and fine workmanship point to a shadowy sub-culture of people who actually live an anachronistic (i.e. victorian era) lifestyle, where victorian haute couture is not just a fun and occasional activity, but a full time way of life. I bought the items I have for a specific performance related reason and usage. If anyone has an update on my suspicions, please post on FB at Steve Barker. At least you people aren't "furries." 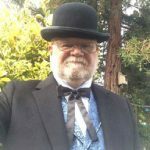 Gentlemansemporium.com is an excellent resource for readymade historical or stylized historical garments and accessories for the stage and film. Although some items are too theatrical for highly realistic historical productions, the mens Trousers in particular are very good for realistic close-up work. As are the selection of men's shirts. They are prompt in shipping and the sizing runs true to size. Even when the fabric is polyester, the construction remains of a good quality consistent with the pricing and fits well or is easily alterable. They are an excellent vendor and very reliable; we use them consistently dozens of times a year. I am a return customer. I have found the selection and service to be top-notch in all respects. I will be coming back for more items in the future! I bought the Callahan frock coat for an actor in our production of Sherlock Holmes. Later when I was able to fit him it turns out he had lost a lot of weight since his measurements had been taken and the coat was way too big! I immediately sent the coat and the tall standing collar for his shirt back and re-ordered in smaller sizes. When that coat came it too was too large! Again I quickly ordered another coat and returned the second one. The third coat got to me right away! I should be able to fit tomorrow but I'm sure it will be great!